This map is expertly drawn and features the region that stretches from the Mississippi Valley upwards towards the Appalachian Mountains. This map was drawn right around the time of the American Revolution by French mapmaker Rigoberto Bonne. Bonne was a noted cartographer of his day in that his works begin to detour from the traditional cartography we see in past french maps. Ornate borders and compass roses are all but abandoned in exchange for a more detailed, and historically accurate work. As a result, the map coloring is excellent and the detail is exquisite. Several different Indian tribes are noted as they would have been important to the fur trade industry. Early french explorers are credited with establishing a strong trading rapport with the Indians. Beaver fur was exchanged for other goods and it became the new currency in time. It also gave the native Americans great political influence in the developing new world. Also, since this is a French rendition, French forts are prominently noted as well. This was of great use to other french explorers who might use the map for navigation and trade. Clear, reliable information was always an asset in a land filled with exploratory possibilities and change. the French had the best relationship with the native Americans leading up to the Revolutionary war. Several other fine details and points of interest are noted as well. This map would have served as a key navigational guide for any explorer. As such, most of the time these maps were well protected and kept secret from other exploration caravans. One final note of interest. You might also be struck by the small size of our country as well. It is always fascinating to see our nation expanded through cartography. Every 10 to 20 years new territories were added that would later become states as our quest for westward expansion and expiration grew. The maps are beautifully hand-tinted in color and in brown tones. The print on the smaller size is readable, but the larger size is much easier to read. For detail of the upper River, Minnesota, and east to Michigan and the Appalachian mountains, these maps are my favorites. Hand painted and numbered by artist Lisa Middleton. This item is sold without frame. This is a hand painted reproduction of a truly historical map. it’s original state was black and white, yellowed with age and possibly torn or creased. I copy the original and clean it up so I can paint it and then re-distress it so it looks antiquated. It is bursting with all the color and character. It is easy to read and suitable for the office or living room. 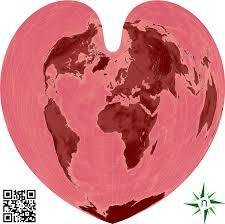 Maps make great gifts and memories. This is a beautiful Map in French. 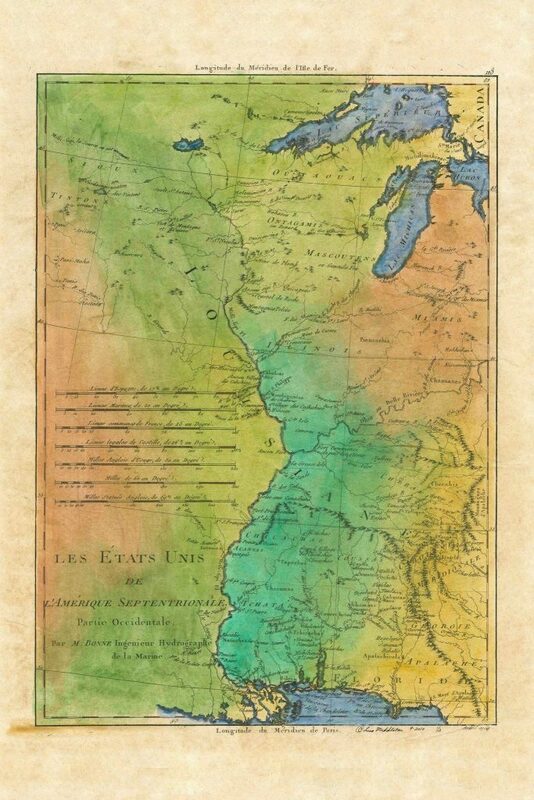 It’s the first map to call the US “United States” and indicates the Native American tribes along the Mississippi River. Also available as an 11×14″ Easy to frame print for $24.95. Contact Lisa for details.